Find our most frequently asked questions (FAQ) below. As always, if you need help or have additional questions, don’t hesitate to call. Is the Recovery Center safe and comfortable? Recreational facilities: pool table, ping-pong, basketball, disc golf, bicycles, workout room. Your day starts with breakfast served between 7:30-8:30a.m. You will have two program sessions in the morning. Lunch is from 12:15PM-1:00p.m. You will then have an afternoon program session and an hour of study/reflection time. At 3:30PM-5:30p.m. Health wellness Program; dinner is from 5:30PM-6:30p.m. Additional planned activities are provided nightly starting at 7:00p.m. These activities are a mix of outings and/or in-house activities planned by our professional activities program directors. The house is quiet by 11:00. The Commission on the Accreditation of Rehabilitation Facilities (CARF) has accredited St. Gregory Recovery Center for three years, the highest accreditation available. Although a number of programs identify themselves as leading programs, few have obtained both recognition by large insurance carriers and international accreditation. According to CARF, St. Gregory Recovery Center has been able to “meet internationally recognized standards of quality in the provision of outcomes-driven programs and services to enhance the lives of the persons served.” CARF has been setting the standards for excellence in rehabilitation for the past 40 years. Yes. We accept most insurance depending on the specific policy you are covered under. Our admissions department can verify your benefits before arrival. You may also submit our online form to verify insurance coverage. I am coming. What do I bring? One week of clothing; we have a free laundry on site. Gym clothes, swimsuit, and a pair of athletic shoes. Money is needed only for toiletries, personal items, and incidentals. Our policy is that if anyone drinks or uses drugs while enrolled, they will be expelled from the program with no refund. Random drug tests are conducted throughout the program. Usually, the need for detox can be determined through our admissions department before arrival. If you are currently using high doses of opiates, benzodiazepines, or alcohol, medical detox is usually necessary. Our medical staff will assist in determining the need for medically managed detox services on arrival. Do you have any drug and alcohol treatment facilities closer to me? Clients come from all over the U.S. to attend the St. Gregory Recovery Center, so unless you live nearby, some travel will be required. Being out of your home environment ensures that you are truly able to focus on the program without the distraction of outside factors. Also, as people reflect on the life changes they need to make and recognize that their world is changing, they will feel some apprehension as they face those challenges. By being away, they can focus on the challenge at hand, rather than easily returning home. At the same time, we continually emphasize that the purpose of this time away from home is to be able to apply the perspectives and skills learned here to the actual circumstances of one’s life. That is why we work with the client as well as the client’s family to prepare for the transition back to the normal home and work setting. Does your program have a spiritual component? This is one of the ways in which the St. Gregory program differs from 12-step-based treatment programs. In our program, spirituality and religious faith are recognized as potential resources for overcoming addiction, but it is up to the individual guest to decide whether and how to use these and other such resources. At St. Gregory’s, some form of meditation and centering oneself, including religious observance, is encouraged, but no specific spiritual or religious practices are imposed. Time and space for meditation are provided. Be assured, though, that each guest’s personal beliefs and preferences are respected. Are there any studies that support the St. Gregory Center? In 2003, William R. Miller (Department of Psychology, University of New Mexico) and his colleagues rated 48 kinds of treatment by combining the results of 381 controlled trials that had compared the effectiveness of a treatment [method] with either no treatment or with other alcoholism therapies. The treatment with by far the best score was “brief intervention,” followed by motivational enhancement, community reinforcement, and social-skills training. The least effective treatments were found to be general alcoholism counseling and education, ordinary psychotherapy, and confrontational therapies, the very treatments most utilized in the U.S. (Twelve-step interventions and AA were ranked 37th and 38th, respectively, among the 48 treatments reviewed). 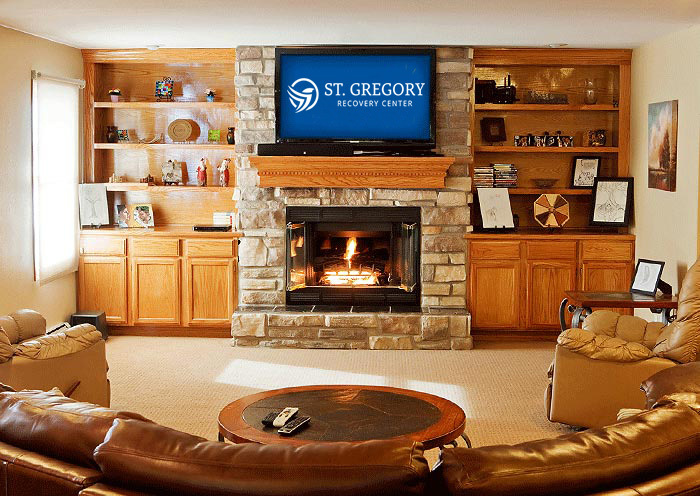 St. Gregory Recovery Center is a program that emphasizes values and motivation, behavior modification training, life-skills exercises, Cognitive Behavior Training (CBT), and community reintegration. In 1990, the Alcoholics Anonymous General Services Office (the governing organization overseeing all “autonomous” meetings) published an internal memo that was an analysis of a survey period between 1977 and 1989. According to this memo, “After just one month in the Fellowship, 81% of the new members have already dropped out. After three months, 90% have left, and 95% have discontinued attendance inside one year!” (Kolenda, 2003, Golden Text Publishing Company) That means that in less than a year, 95% of the people seeking help from AA leave the program. Regardless of the apparent success rate or cost of the initial 12-step-based treatment program you may be looking at, the 5% success rate of AA after a year eventually becomes the actual program success rate. Do I need aftercare or AA meetings for the rest of my life? No. Meetings are an extension of a disease-model approach that encourages lifetime involvement. Essentially, reliance on AA or NA support groups for sobriety has two negative consequences. First, individuals become emotionally trapped in a mindset of addiction with no room to progress and move on with their lives, regardless of circumstances. Second, individuals must define themselves as addicts or alcoholics. We believe that addictive behavior is a dependency you have built from your choices, and that because you can change those choices, they should not define your future. The purpose of the St. Gregory program is to teach our guests how to move on with their lives. Traditional programs do not believe it is possible to fully recover from addiction, and therefore they assume that lifelong treatment is necessary to prevent relapse. We know people can overcome addiction. In fact, we see it happen every day! Most programs are 28 days. Why is yours longer? 28-day programs exist solely because that is a length of time commonly reimbursed by insurance companies, not because it’s an effective time frame for any specific treatment model. Unfortunately, the field of addiction treatment has been influenced more by compliance with insurance companies, pharmaceutical companies, and profit than by what really works. Our alcohol and drug treatment program is focused on results. Research has shown that the model and techniques taught through our program require longer learning periods than are available in a 28-day program. A longer program allows sufficient time to instill and practice the new learning before applying it to one’s life back home. It also allows more time for the physiological benefits of the nutraceutical program to take hold. See the Program Overview for a better understanding of the impact of behavior modification training, life-skills exercises, Cognitive Behavior Therapy (CBT), and health wellness. St. Gregory Recovery Center does not believe that an individual is powerless and addicted forever. (Research does not support this idea either.) We are an empowerment-based recovery program that focuses not just on “how to not drink or drug,” but on what factors are driving those behaviors and dependencies in the first place and how to change them. We believe that people can change their lives for the better and that the term “addiction” is a better definition of where you are stuck than who you are. The St. Gregory program is comprised of Behavior Modification Training, life-skills exercises, and Cognitive Behavior Therapy (CBT) in a format not available through any other program in America. Most programs (97%) utilize a 12-step/disease methodology that puts control over one’s recovery in the hands of a doctor or group requiring a lifetime of Alcoholics Anonymous (AA) or Narcotics Anonymous (NA) meetings. The techniques used in our program are based on decades of research and have proven to be vastly more successful than traditional approaches.